Coltur Suites price per day from € 200 . Casa Migliaccio Casa Migliaccio is a self-catering accommodation located in Sorrento, just 300 metres from the train station. Villa Carolina Country House price per day from € 106 . 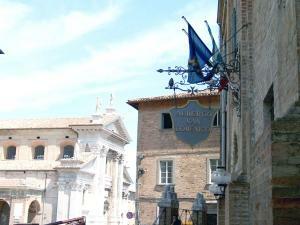 Hotel Antiche Mura price per day from € 275 . Residence Sorrento Featuring a terrace and free Wi-Fi throughout, Residence Sorrento is located, a 10-minute walk from Sorrento Train Station. The private bathroom is complete with a shower and hairdryer. 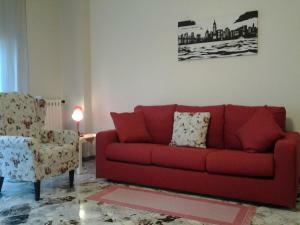 Hotel Sant'Agata price per day from € 83 . Green Paradise B&B price per day from € 60 . Agriturismo Fattoria Terranova price per day from € 60 . Sorrento is located on a plain above the coastline, overseeing the Gulf of Naples. The sight from Sorrento extends way to the north, including Vesuvius, the town of Naples, and the island of Ischia. The city is extremely preferred with travelers, especially the British - without a doubt, English turns up sometimes as being Sorrento's mother tongue. Lots of visitors explore Sorrento in its own way, much more use the beachfront city as a starting point for discovering the Naples area or the Amalfi Shoreline and island of Capri. The city gives its name to the Sorrento Peninsula, a big area stretched from Vico Equense to Massa Lubrense. Sorrento Peninsula, because of its geographic form, withheld between the green mounds and the blue sea, has constantly been a amazing tourist attraction of the Southern Italy. With its nearly 12 thousands holiday accommodations in over 150 lodging units and over ten additional accommodations types among which are camping sites, b&b, holiday houses, budget apartments, holiday villages and about thirty farm holidays. 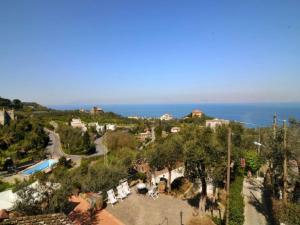 Obviously, the Sorrento Shore is among the most preferred spots of the whole Campania area. The town of Sorrento is used to the continuous incursions of Western European tourists, especially Brits and you listen to the English language all over the town. The residents know their market; pubs offer chips and hotdogs, and waiters persuade guests into coffee bars with promises of 'a nice cup of tea'. The closest flight terminal to Sorrento, just fifty kilometres away, is Naples Airport. Guests who come to Naples by aircraft have the option of using the everyday bus connections, by the Curreri bus service. On a daily basis, as a matter of fact, six everyday trips are offered linking the airport with Sorrento. Taxis are additionally offered from the international airport to take you anyplace in the region.The Naples Main Train Station s situated at Garibaldi Square and is served by the metro lines and with the public bus service. The Federal Railway System provides a vast range of trains to Sorrento every day, every 30 mins, from 6:00 am to 11:00 pm. Basilica of Sant' Antonino - was devoted to the Patron Saint and was constructed around the year 1000, then it was refreshed and reconstructed in the 18th and 19th century. Sorrento Cathedral looks over the street "Corso Italia". It was constructed at the beginning of the 15th century in a Renaissance style and later on it was reconstructed a number of times until the final reconstruction in early 20th century during which its face was refurbished completely. Piazza Tasso - central location and main square in Sorrento. Sorrento Cape - his geographic position, midway between Massa Lubrense and Sorrento, reachable also by bus, presents the Regina Giovanna Beaches and the historical site of the villa of Pollio Felice. San Francesco abbey is composed of three buildings: the church, the abbey and the well-known cloister. The church was constructed in the XVI century in Baroque style, but with a front in white marble that was developed in 1926. It holds significant works as the wood main door, representing the Saint with the Crucified. Correale Museum - The museum is dispersed on three floors, with a total of 24 rooms and the loft space that is used as an expository space. 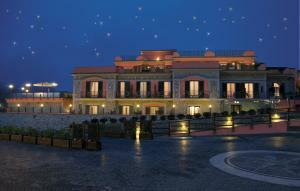 Sorrento provides a vast range of accommodation possibilities, and you can select anything between budget and luxurious. 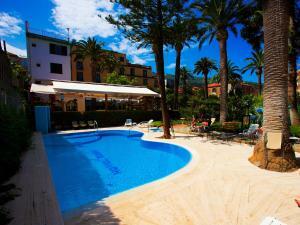 There are plenty of holiday apartments available, which satisfies tourists who prefer to self-cater. If you're staying for more than a couple of nights, this may be an interesting alternative as you can stop by at one of the town's supermarkets as an alternative to dining at restaurants. Similar tourist destinations in Italy: Verona, Napoli, Ischia, Lucca, Palermo, Alghero, Lido Di Iesolo. Park Archeologico del Pausilypon, Naples, 26 km from the centre of town of Sorrento. Teatro di San Carlo, Naples, 26.5 km from the centre of town of Sorrento. Museum San Martino, Naples, 27.4 km from the centre of town of Sorrento. Spaccanapoli, Naples, 27.5 km from the centre of town of Sorrento. Museum Cappella Sansevero, Naples, 27.5 km from the centre of town of Sorrento. Archaeological Museum Naples, 28 km from the centre of town of Sorrento. Catacombe di San Gennaro, Naples, 29.5 km from the centre of town of Sorrento. Ski resort Fiorentini, number of ski pistes: 4. 31 km from town of Sorrento. Ski resort Villaggio Palumbo, number of cross country pistes: 35km. 50 km from town of Sorrento. Ski resort Campo Felice, altitude: 1350m. 82 km from town of Sorrento.